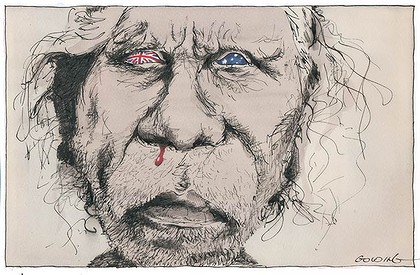 Australia Day stands as a reminder of massacres. Why should Aborigines celebrate it? This was Frederick Douglass, an American slave who had taught himself to read and write contrary to all the laws and provisions concerning slaves. His Narrative of the Life of Frederick Douglass tells the story of slavery, the story of overpowering cruelty and abuse by the white man, the story of Christian hypocrisy, at its flag-fluttering best, and the story of his flight to freedom. What might an Aboriginal person say of Australia Day? Why should the Aborigines celebrate that day? It was the day that marked the theft of a land (terra nullius), the day that marked the theft and abduction of a people, of a culture, the day that initiated the pathways to the Stolen Children and, to our ultimate shame, the deaths in custody. It is a day that stands as a reminder of massacres. The wind-stench of bodies burned in bonfires hangs heavy upon the nation's conscience and in the clouds. This is not some John Howard ‘black armband’ view of history, rather a white man's whitewash. You can shuttle history, but you cannot shuttle facts. It would be a great Australia Day if it faced honesty, historical facts, abandonment, hypocrisy, shelved superiority and embarked upon an exercise of spiritual empathy rather than religious hubris. Let's meditate upon this quotation from an editorial in The Argus newspaper on March 17, 1856. I wonder what Howard and Keith Windschuttle would make of this? ‘We never listened to a discussion in the Legislative Council which more strongly stirred within us the sentiments of a bitter indignation, than that which took place upon the sum placed on the estimates for the Aborigines. We have long held the opinion that as a people we are guilty of the basest meanness and dishonesty in our treatment of this unhappy race. And that impression was most vividly freshened by the scene we refer to - by the contemptible sum which the present occupants of this colony award to its original possessors [and] by the indecent levity by which the whole discussion on the subject was characterised. These poor wretches have evidently few enough friends. It is only fair to devote an hour to the pleading of their cause. ‘It would seem that never does the white man … appear in a more thoroughly despicable light, than in his dealings with his less civilised brother. He takes possession of the land as a matter of course. He alters water-courses, drives off game, fences, clears, and cultivates, tears open the very bowels of the earth, and walks away with uncounted wealth, while the original occupant of the soil, not only looks helplessly on, but sinks, contaminated by the new vices, and wasted by imported diseases, into premature extermination. And we - a Christian people - God-fearing, magnanimous, intelligent race - with a history to look back to, and a character to support - stand quietly by, and do not feel the disgracefulness and sin of such a position! ‘As the mind continues to dwell upon the subject, it really becomes too humiliating and too irritating to be treated of with moderation. If the so-called 'savage' be sufficiently astute to strike a bargain for his land, my noble Caucasian condescends to buy it. If the native be too simple and unguarded to stipulate for payment, it quite consorts with Anglo-Saxon purity to take it without payment. If Copper-colour is so far advanced towards civilisation as to know the value of property, and still more if he have such a knowledge of war as to make him dangerous, Pale-face fumbles at his breeches-pocket. If the Aboriginal be dull in intellect and deficient in physical force, the white man thinks it no shame to steal! What, to true nobility of nature would be an additional plea for fair and even liberal treatment - the helplessness and unsophistication of those we dispossess - become with us - oh, shame, shame that it should be so - the opportunity for dishonesty and fraudulent misappropriation. In the light of the news about Australia's seat at the United Nations, it is sanguine to recollect what John Pilger said in his article ‘Fighting for justice when your skin's black’ in The Age on October 4, 2012: ‘No country since apartheid South Africa has been more condemned by the UN for its racism than Australia.’ He refers there to CCTV footage showing a policewoman cleaning blood off the floor of an Alice Springs police station while, as he says, ‘… a stricken Aboriginal man was left to die’. Washing the blood away doesn't wash away the stain.